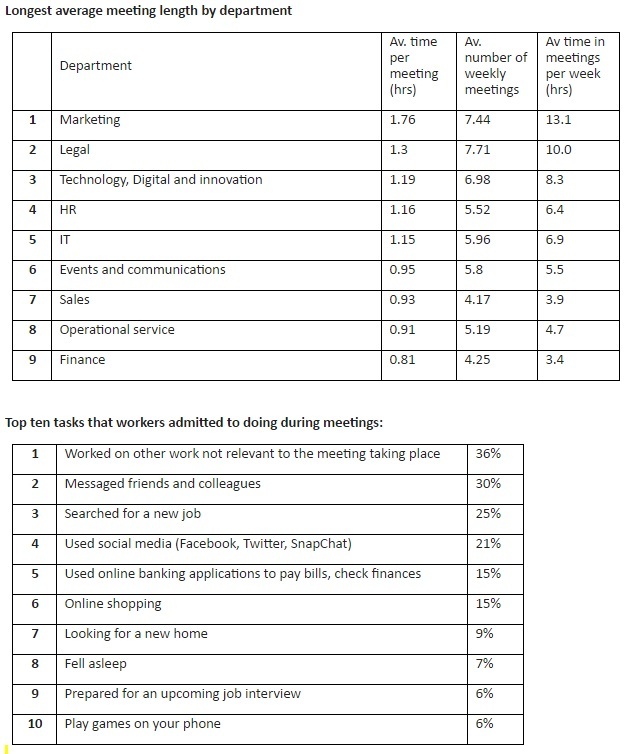 Marketing departments are the biggest time wasters in meetings., costing £1,400 per employee per year, according to a cross-industry study. A study of 500 professionals, from collaborative platform Wisembly, found that much of this unproductivity is down to marketers failing to remain focused during meetings. Those working in marketing departments spend over 13 hours a week in meetings, with each meeting lasting an average of 1hour, 42 minutes – 35 minutes longer than the average across all departments (1 hour, 7 minutes). At a time when the UK productivity gap has widened to the worst level since records began2, poor meeting management is draining a substantial amount of time and energy from offices across the UK. The study found that over a third (36%) of meetings scheduled are considered unproductive, which equates to over two and a half working weeks wasted every year. The research found that more often than not, meetings did not meet their objectives, with over half (50%)of meetings being primarily used to decide that another meeting should be scheduled. 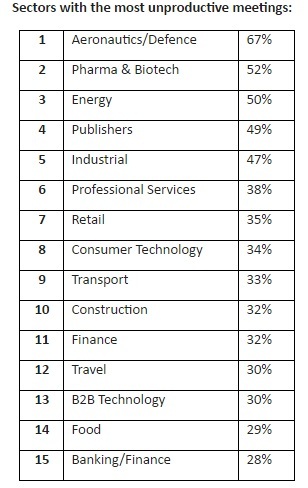 Over nine in ten (94%) employees admit to using the opportunity in meetings to tackle irrelevant tasks with a quarter (25%) even resorting to searching for a new job. One in 14 employees sleep during meetings and 828,000 UK employees have even spent the time on online dating apps like Tinder. 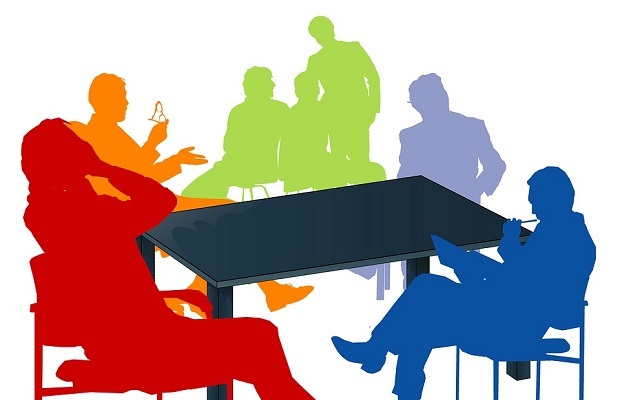 Despite meetings supposedly being a collaborative affair, many employees experience the opposite, with two in five (41%) employees saying the meeting they attend are dominated by just one or two characters and one in five (20%) meetings even leading to arguments. Meetings are also having an adverse effect on employees, leaving nearly four in ten (38%) employees more stressed and over a third (36%) feeling less motivated. A concern for businesses is that one in five (21%) lose confidence in the person leading the meeting. However, 92% of British workers would feel more happy and engaged at work if they were able to express freely their ideas. To help businesses understand how much money and time is being wasted in their meetings rooms, Wisembly has developed a Meeting Cost Calculator. The tool can analyse the productivity of businesses’ meetings and generate an associated cost.